One of the best things about using an iPad is the great apps that we can run on it. There are excellent apps for just about any purpose you can think of. Better still, there are lots of great free apps for the iPad. Our Best Free iPad App of the Week posts celebrate these apps. Lose weight with MyFitnessPal, the fastest and easiest to use calorie counter (now optimized for iPad!). With the largest food database of any calorie counter (over 1.2 million foods), and amazingly fast food and exercise entry, we’ll help you take those extra pounds off! There is no better diet app – period. Happily, this app absolutely lives up to that description. 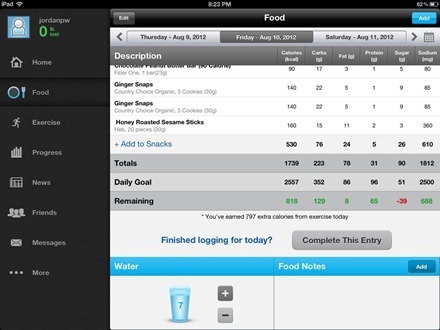 I’ve used a few similar apps on the iPhone and iPad and this is easily the best I’ve seen. ■ Easiest and fastest food entry – remembers your favorites, add multiple foods at once, save and add entire meals, and more. .
■ Free barcode scanner – easily find foods you’ve eaten. Other apps charge for this, ours is 100% free. ■ Fully syncs with the web, so you can log from your computer or your phone, which ever is more convenient. Plus your data is backed up online so you never lose it. ■ IT WORKS – our users have lost more than 20 million pounds combined! Their success shows we can help you lose weight too. The range of foods this app knows about really is amazing. I can’t find anything that stumps it yet. I am especially happy that it includes just about every item I get at HEB and Whole Foods here in Austin, TX. The entries for exercises are similarly extensive. 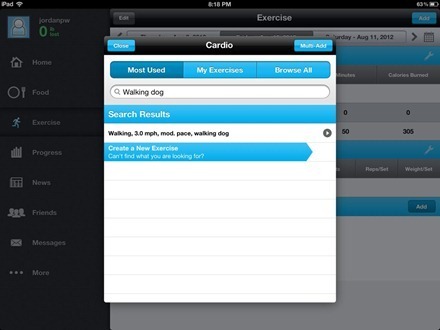 It even has a handy entry for dog walking, which is a big part of my daily routine. It also offers a lot more detail on foods than other apps I’ve seen – letting you see your running daily totals for not just calories but carbs, fat, protein, sugar and sodium as well on the daily food page. When you tap on an individual food entry you get even more detail – including fat breakdown (saturated, trans etc), fiber, Vitamin A and Vitamin C and more. 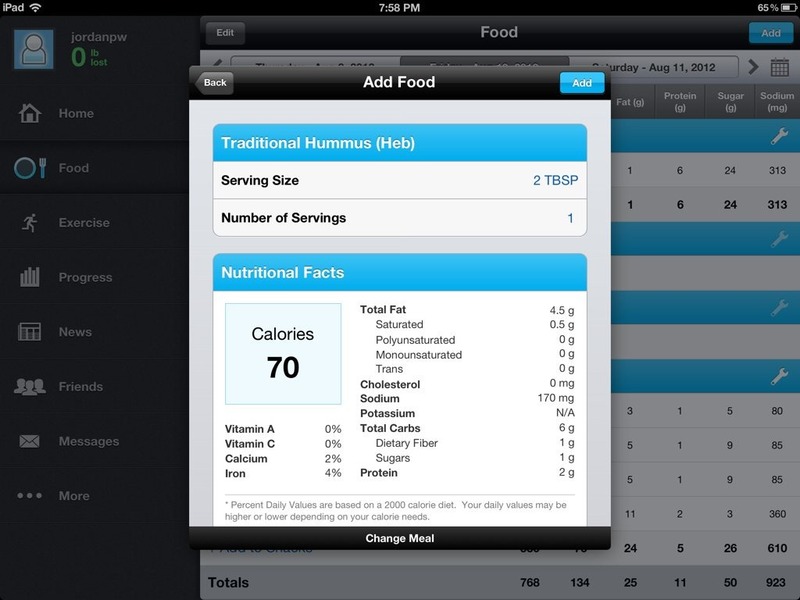 The home screen gives you a great summary view of how you’re doing – and the app’s remembering meals feature is very nicely done too. If you have set goals within the app, when you finish logging for a day it shows you a popover letting you know that if every day was like this your weight would be X in X number of weeks. There’s also a free iPhone version of the app, Calorie Counter and Diet Tracker by MyFitnessPal – and because you sign in to the app with a free account everything stays perfectly in sync between the two. The iPhone is generally more handy for logging foods when you’re out and about of course – but I’m finding that I much prefer the iPad’s big screen for getting a good luck at how the day went and progress in general. 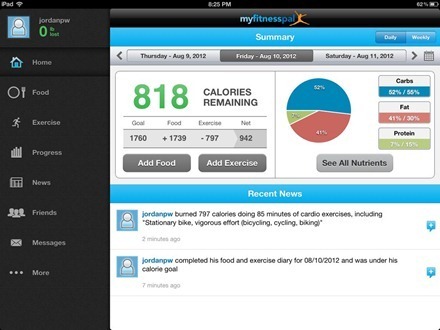 You don’t have to be on a mission to lose weight for this app to be useful. It’s a great way to just keep track of what you’re eating and how much you’re exercising – which is never a bad thing if you’re looking to maintain a healthy lifestyle. 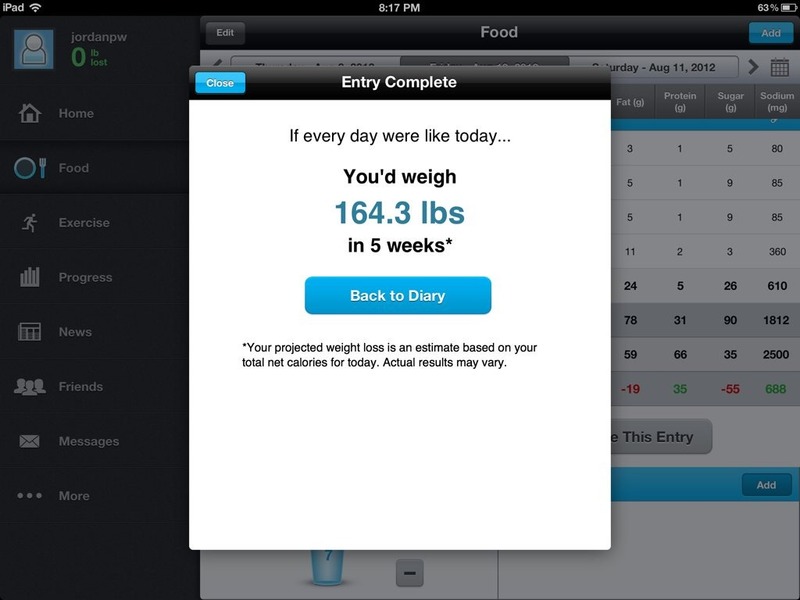 I’m a big believer in tracking what I eat and I’m also currently trying to drop a few pounds – and this app, again, is easily the best I’ve seen for this purpose. 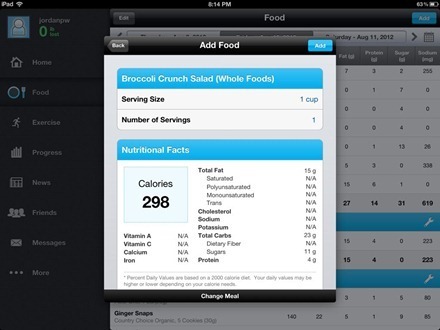 Here’s an App Store link for Calorie Counter and Diet Tracker by MyFitnessPal HD. 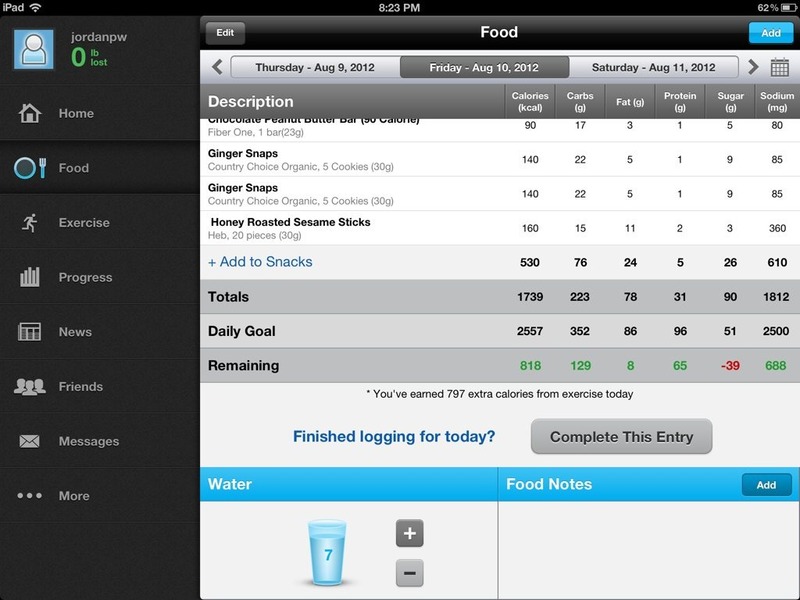 Ive been using this app since January and have so far lost 32lbs! 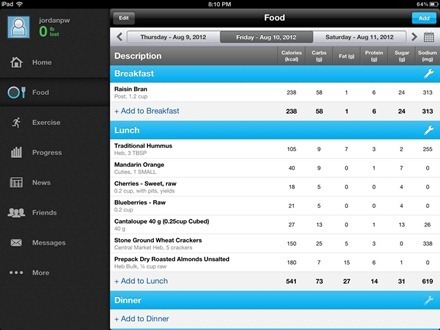 I learned how to manage my portion sizes, up my exercise and keep track of the takeaways so they weren’t too frequent. For me a life changing app! Oh and the UK food products are well covered in the database. I love this app! I’ve lost about 8 lbs. I also have the it it activity tracker that links to it. This app looks to good to be free. And it is very good as well. 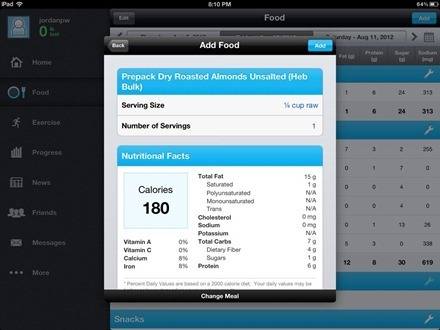 One of the best weight loss apps there is on the market now (and for free!! ), if not the greatest! !